Here I go again squeezing in my Test Kitchen down to the wire, but you have to cut me some slack because I was hit two weeks ago with major seasonal allergies. 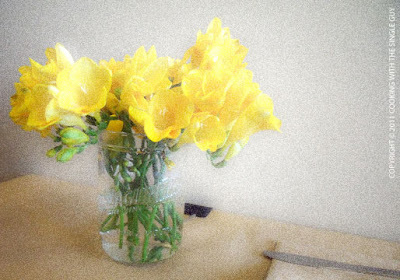 I didn't feel like doing anything for more than a week. This recipe is actually perfect for right now because all the ingredients are at their peak right now, namely the peas and morel mushrooms. 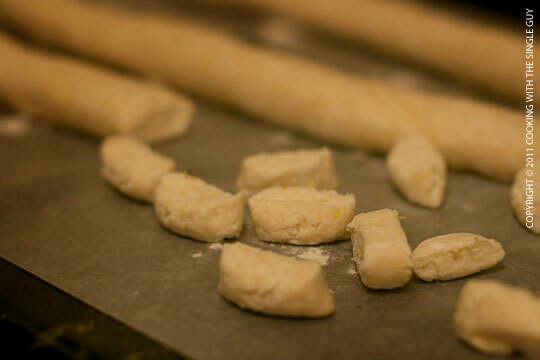 But it was the first time I made gnocchi, which I love to eat but don't make because I just hate the idea of getting flour all over my new kitchen (also another reason why I don't make fresh pasta). The first thing I had to do, according to Symon's recipe, is to drain the whole-milk ricotta overnight. So here's about a cup of ricotta I bought at the Pasta Shop in my neighborhood, sitting in a fine mesh strainer in a big bowl. You can really see, but there's just a bit of water on the bottom of the bowl. I guess the ricotta I got wasn't that wet. 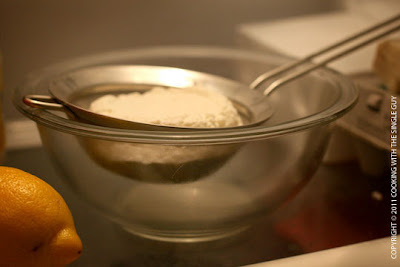 The next day I was ready to make the ricotta gnocchi (Symon's recipe isn't potato gnocchi but the fluffy ricotta version of his grandmother's), starting with 3/4 cup all-purpose flour in a bowl with 1/2 cup of grated Parmesan cheese, the zest of one lemon, and 1/4 teaspoon kosher salt. Then I added the ricotta along with one large egg and with my hand started to mix everything together until it started to form into a dough. But Symon warns not to overwork the dough, so I didn't do this very long. 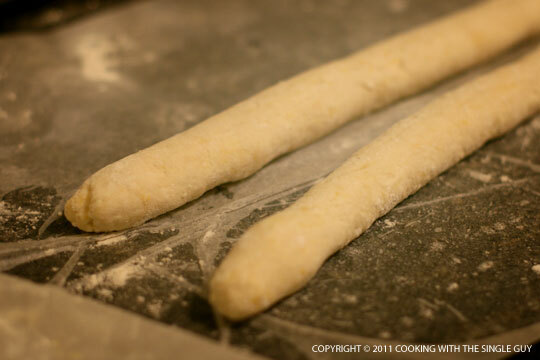 After letting the dough rest in the refrigerator, I took them out and cut them into 1/2-inch pieces. You can imagine that this creates a lot of gnocchi, so I kept out the amount I planned to eat that night, and the rest I put into a plastic bag and froze them for future dining. Now I could focus on the sauce, and here is where I just did half of the recipe since I was making enough for just me. So the amounts I list here is enough for one serving. 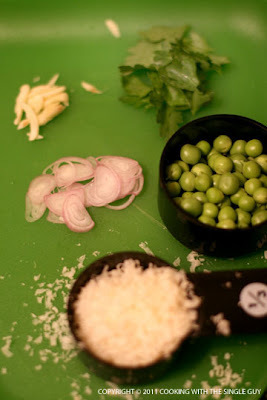 This included one garlic clove, thinly sliced, half a shallot (also thinly sliced), 6 leaves of fresh flat-leaf parsley, 1/3 cup Parmesan cheese, 1/2 cup of shucked fresh English peas, and the juice of 1 lemon. 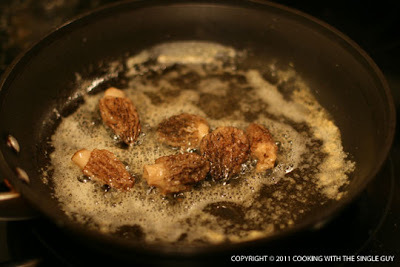 I also had to prep the morel mushrooms. To do this, Symon suggests soaking them briefly in a warm salted water and then rinsing them off and gently patting them dry. 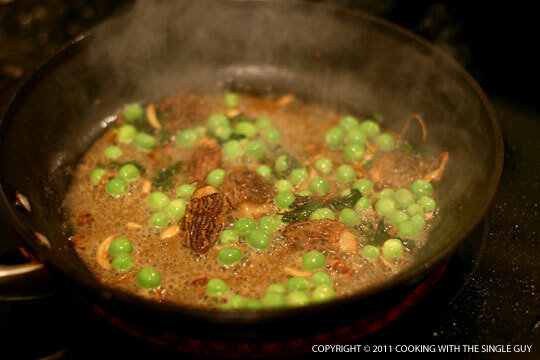 The recipe calls for 12 medium morel mushrooms, so I used about 6 or 7. 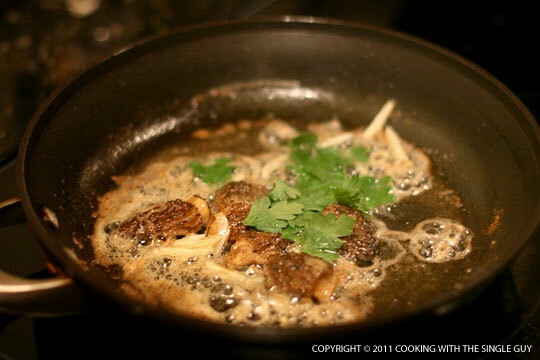 The sauce is also a brown butter sauce, so to start I use about 2 tablespoons of butter in a saute pan over medium-high heat, and then started with the morel mushrooms, cooking them for about two minutes to allow them to soften. Then I added the shallots and a pinch of salt. This all happens pretty fast, so next I toss in the garlic and parsley. I actually don't like the idea of throwing in the parsley so early because it pretty much disappeared by the time I was done cooking. Next I add the peas and lemon juice, cooking just until the peas are brightened and then I took everything off the heat so I can crisp up the gnocchi. In another pan, I heated up another 2 tablespoons of butter, cooking it over medium heat until it turned brown. Then added my gnocchi. Now, the recipe says to cook for about 5 or 6 minutes, so I thought I'll cook each side about three minutes but that didn't turn out since my new stove top was so hot. 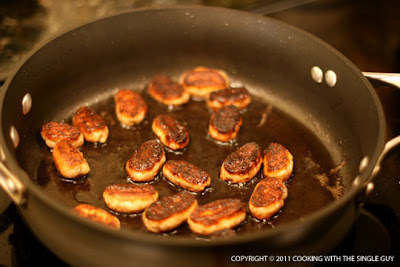 So basically after I flipped them over, my gnocchi was more than crispy they were nearly burnt. 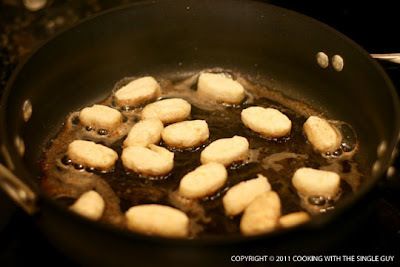 So lesson learned is that the timing is just suggestions, and you really have to check the gnocchi based on the heat. If your butter is really hot, it shouldn't take that long for them to crisp up and get golden brown. Once the gnocchi were crispy on both sides, I added in the morels and mushrooms and added the 1/3 cup of Parmesan cheese. The recipe said to add another tablespoon of butter, but I was already getting grossed out by all the butter so I skipped that. Here's my finished gnocchi with morel mushrooms and spring peas. The peas were overcooked and several of them actually started to pop. The morels turned out a bit dark, so they blended in with my burnt gnocchi. Definitely not my most successful test kitchen. Don't add the parsley when the recipe says. I would actually add it last with the Parmesan cheese. Be careful not to burn your brown butter. Once you have that nice brown color, turn down the heat. Watch your gnocchi to make sure they don't burn. Depending on your stove, they may cook faster than you think. Ease of cooking: This is a simple recipe, even making gnocchi. Even though I burnt the gnocchi this first time, they did taste fluffy and nice with the lemon zest, so I'm looking forward to eating the ones in my freezer. The sauce was pretty easy to make, and it's a quick dish to make once you got the gnocchi prepped. 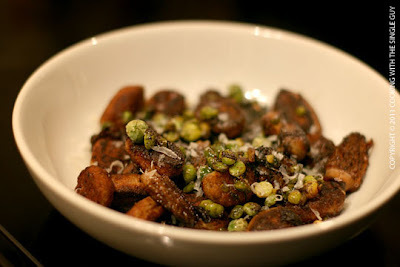 Taste: I did like the gnocchi, but the brown butter was just too much butter for my taste. I don't know if I got much other flavor, since the butter drowned out the natural flavors of the morel mushrooms. Overall Grade: C. Even though it was my fault that I burnt the gnocchi, I think the recipe just gave bad advice about timing and I didn't like the fact that so much butter was used. I like the idea of crispy gnocchi, but I think I could crisp them up with olive oil and then maybe just make a light sauce. 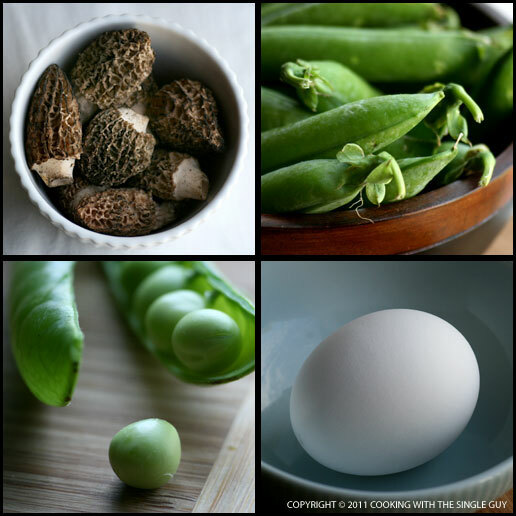 Don't forget to vote in June's Test Kitchen poll in the upper right hand column. Since I've mostly been using cookbooks by male chefs, this month I'm featuring a female, Donna Hay, known for her quick and easy recipes. In fact, the book is called "New Food Fast." I've had this cookbook for awhile and mostly fell in love with the photography. Sometimes I felt the recipes were too simple, but right now after some complicated recipes I'm ready to do something quick and easy. Hope y'all are having a great Memorial Day weekend. 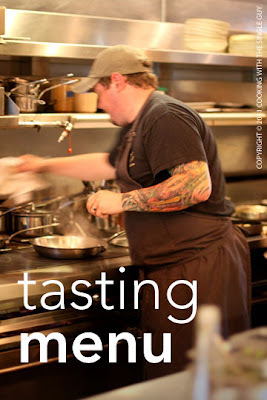 Mine started out lovely when I made a reservation last night for a special 5-course dinner at Plum in Oakland's Uptown. 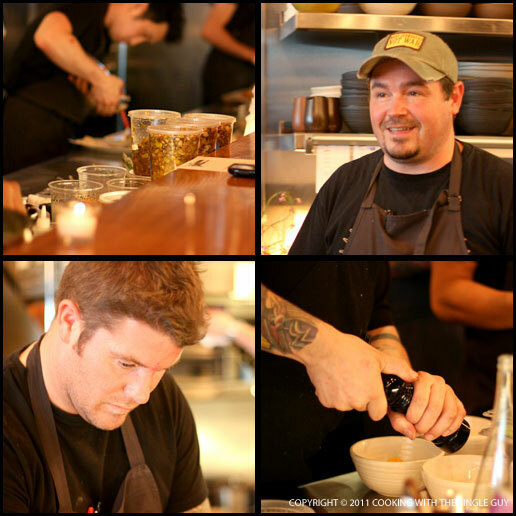 Plum is the East Bay casual yet refined dining spot of Chef Daniel Patterson of San Francisco's celebrated Coi. While the restaurant has generated a lot of interest under the watchful eye of Chef Charlie Parker, Patterson has decided to use it for occasional charity dinners showcasing some guest chefs from around the country. Last night, a dinner raising funds for the Larkin Street Youth Services featured Chef Sean Brock of Charleston's McCrady's and Husk. Brock has garnered much attention for his restaurants because of his goal to locally source all his ingredients to create his elegant Southern dishes. 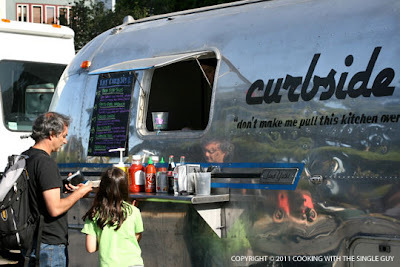 The locavore approach, of course, marries nicely with the cuisine at Plum, which emphasizes local California ingredients. The Plum dinner was fully booked, with the five-courses going for $75. I arrived and took my seat at the restaurant's long wooden bar counter, giving me a front row seat of all the chefs in action, including Parker (who looked like he was expediting the courses for the evening, and seen in bottom left of the above shot) and Brock (top right), who was in charge of the two main courses of the five. 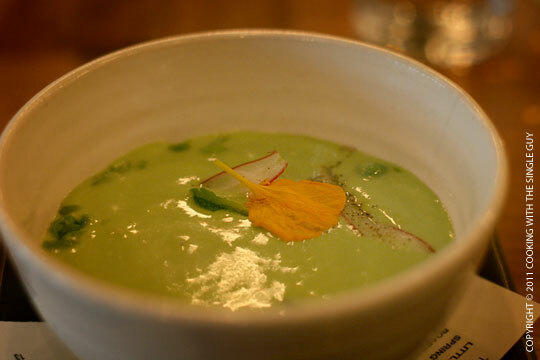 Despite the chilly evening, the cold soup was still refreshing with that spring-like flavor of the pea (which included some full peas that weren't pureed) and the nice crunch of the radish and creaminess of the Parmesan. 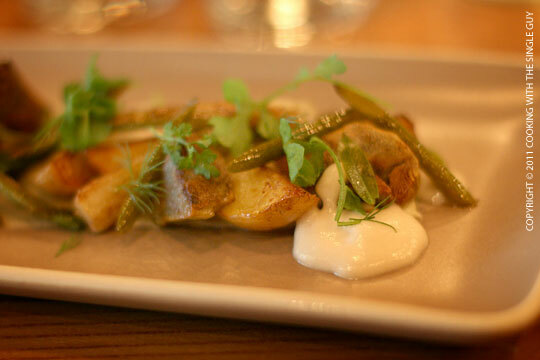 Second course was a tray of eucalyptus-smoked potatoes with artichokes, shallots, green garlic and dill. This was such a fun dish to eat because of the differing textures. The smoked potatoes did have a nice smoky flavor although don't know if I could detect that the smoke came specifically from eucalyptus leaves. Artichoke hearts are always lovely to eat, and so were the grilled green garlic, but there were a couple of ingredients on the plate that added to the complexity but weren't listed on the menu. 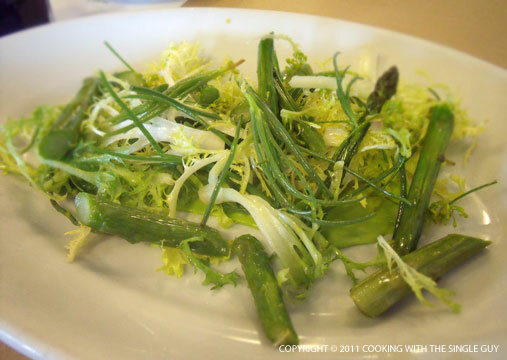 There were these thin vegetables that looked like they could have been very thin asparagus. But they were pickled and a bit crunchy. Being a pickle fan, I love this added ingredient. There was also a white foam that was very creamy, but I couldn't tell by the flavoring what it was made of. Everything on the plate pulled together nicely for a real celebration of California spring (again, despite the fall weather we've been having). 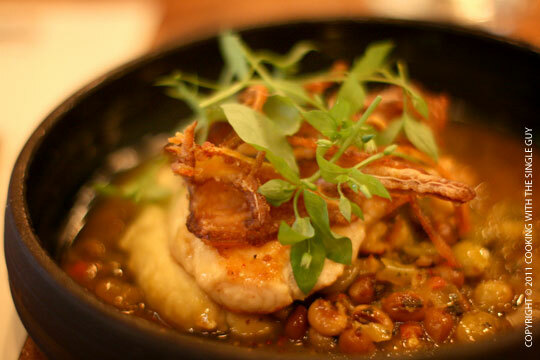 Then we moved onto the courses from Chef Brock, starting with this amazing Carolina catfish dish sitting on cornbread puree, field peas and crawfish "chowchow" and topped off with crispy pig ears. The field peas were cooked like a French cassoulet, very comforting and creamy, although a bit sweet because of the chowchow (which I guess is a type of Southern-style relish). I didn't really detect much of a crawfish flavor, but that didn't matter since I enjoyed the catfish filet that was nicely golden brown. As you can guess, though, the winning ingredient was the crispy pig ear pieces on top that were such a nice added texture. 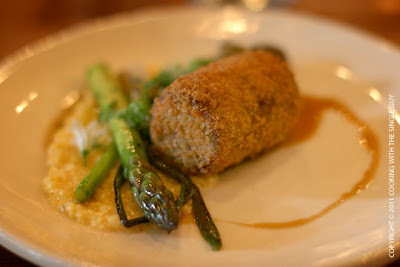 The fourth course was a crispy pork shank served with samp grits, wild ramps and asparagus. The pork shank looked almost like a breaded elongated croquette, with the somewhat shredded pork interior giving it more substance. The sauce on the plate, again, seemed to lean toward the sweet side (I think Chef Brock has a sweet tooth) but luckily that was balanced by the other ingredients and flavors, including a nice garnish of pickled shallots (like I said, I love pickled things) that help cut into the heaviness of the pork. 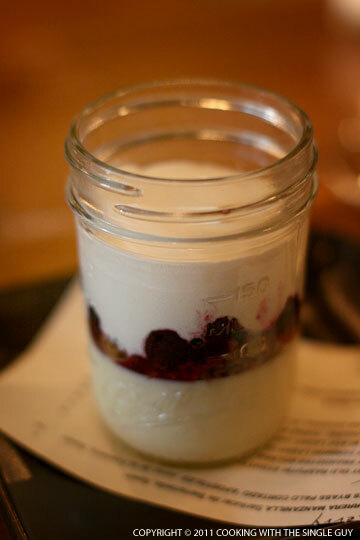 Last course was a lime custard dessert served in a bottled jar like a parfait, with gingersnap crumble, blueberries and condensed milk cream. I just dove into this custard, which had a balanced tart flavor and light creamy texture. It was a nice ending to this primarily Southern-themed dinner. I really enjoyed the journey from California to Charleston in this special tasting menu, providing a nice contrast in styles of the two chefs while noting the commonality in vision about the food they serve. I like these special charity dinners (a more expensive and fancier version took place the night before at Coi) and look forward to seeing who'll be visiting next. There’s been a spree of izakayas opening up around town lately. 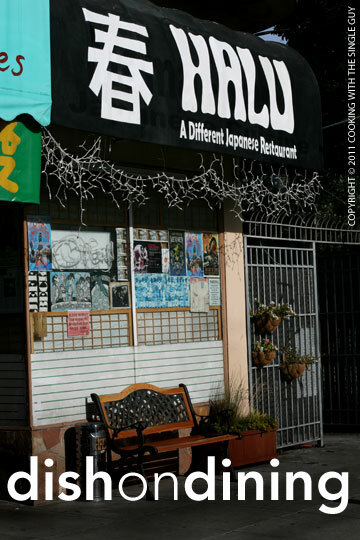 They’re the Japanese-style pubs known for their grilled bites. But one of the early pioneers introducing San Franciscans to the delights of the izakaya is the tiny Halu in the Richmond District. 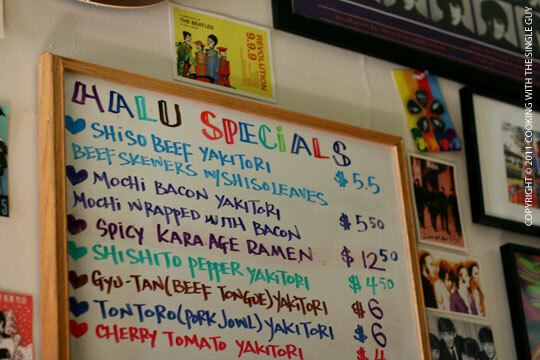 Known for its food, tiny space, and Beatle memorabilia from owner Shigemi Komiyama, Halu is the ultimate divey neighborhood spot. When I visited recently, I grabbed one of the five seats at the counter. You face the tiny kitchen space where Komiyama cooks all the food, but you can’t really see him with the raised shelf and more Beatle memorabilia hanging every where. They weren’t kidding about the Beatle stuff; it’s like a shrine. The menu is broken into yakitori, which are the grilled items, and kushikatsu, or deep-fried items. Then there are three ramen choices and a few salad and side items. After ordering a few skewers, I turned around and noticed the specials board on the wall, which features such specialties as the pork jowl and bacon-wrapped mochi. So definitely remember to check out the specials. Arriving first was the scallops kushikatsu ($5.50). I know, you’re probably shocked that I ordered something deep-fried, but I love scallops and I thought I needed to try at least one item from the kushikatsu section. The scallops looked perfectly cooked and the panko crust a golden brown, but there was a bit of oil squishing out as I bit into the scallops and the coating all fell off at the first bite, unable to stick to the scallops. 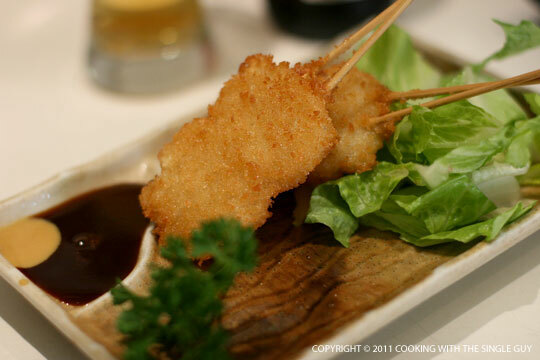 The scallops were served with the traditional tonkatsu sauce and a squirt of hot mustard. Then came the yakitori items (on the menu you can order one or two skewers of each item). I got one skewer of the chicken gizzards ($2.50) and pork and onion ($2.50). The chicken gizzards were crunchy but still easy to eat. I can’t say I’m a fan of gizzards, but I wanted to try them and my server said it’s one of the more popular choices. The pork and onion was a satisfying selection, with perfectly cooked meat with mild sweet onions. 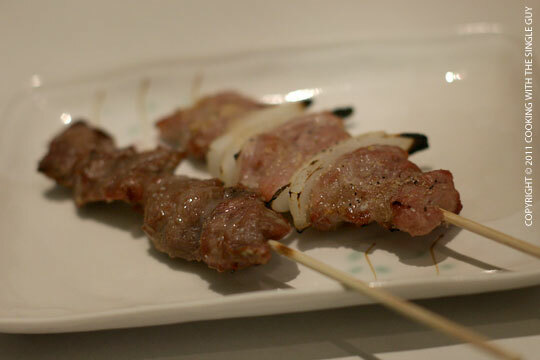 For both skewers, they leaned on the salty side, which meant more sips of my Asahi beer. 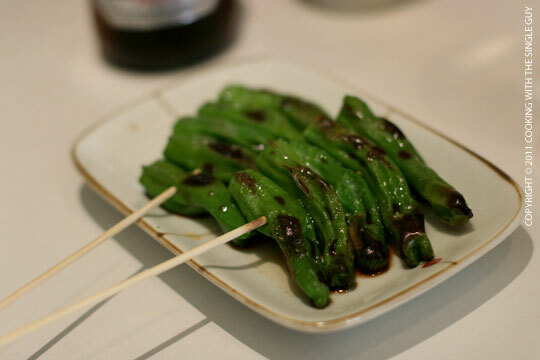 From the specials board, I got the shishito peppers ($4.50), which were brilliant green with bits of grilled blisters when they arrived. They seemed a bit plain when I ate them, though, but was a nice way for me to get some greens with my dinner. The ramen choices at Halu are just the cha shu, veggie and fried chicken. So I went with the cha shu (pork) ramen, which came topped with corn, pickled ginger, half a hard-boiled egg and bean sprouts. All of Halu’s ramen are served in the same meat-based broth. My ramen, while a nice serving, was an average bowl of noodles. 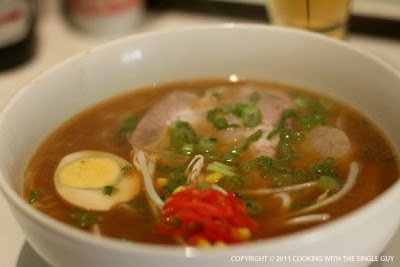 With some really good ramen around the Bay Area, I hate to say that Halu doesn’t seem to stack up well against them. The noodles didn’t have much spring, and the broth flavor didn’t seem to have much complexity or body. And the cha shu, which sometimes can really be tender and memorable, was a bit dry and everyday. I do give major points for the service. 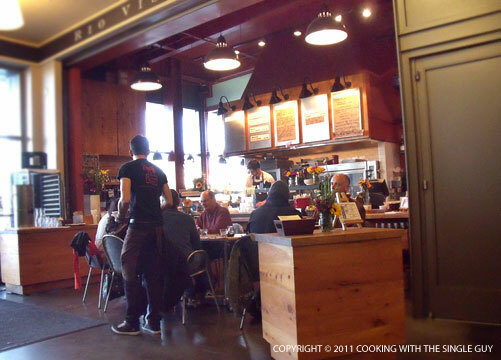 This is really a homey, family-run restaurant, and the young servers are friendly and helpful. You really feel welcomed. While the food at Halu seems a bit standard and not as creative as some of the newbie izakaya, it has a distinctive Rock n’ Roll vibe with a cozy neighborhood feel. Funny how you never heard of something until you go to a foreign country and discover it. Then you come back and you see it every where. That's the case with Hong Kong milk tea, or lai cha. I tried this beverage for the first time during my trip to Hong Kong last month, and I loved the simplicity of it but how it was like morning coffee because of its intense flavor and creaminess. My understanding is that lai cha, or HK milk tea, is made with tea and either evaporated milk or sweetened condensed milk, which creates a nice caramel-like color to the drink. Since I've been back, I've spotted HK milk tea at a restaurant in Oakland's Chinatown, and I read about it starting to be served at Out the Door, the casual sibling of the Slanted Door. There's several locations of Out the Door, but I got my lai cha at the counter at the Ferry Building. When I ordered it, the server made sure that I understood that this was a hot drink, and not the Hong Kong-style bubble tea that people are used to here. I told her I knew it was hot, and she then told me it would take about three minutes to prepare. I ordered a steamed chicken bun ($3) as I waited. When my HK milk tea arrived, it had the exact same aroma as the one I had in Hong Kong, that slightly floral but smokey fragrance. But this version was sweeter, and I checked later and the server said their version is with sweetened condensed milk. Even though I don't have a sweet tooth, I really liked the authentic flavor of the drink. It wasn't super sweet, but was what I imagined a latte would taste if I were a coffee drinker. Now, the cost of $3 is probably how much I would pay for a full breakfast and milk tea in Hong Kong, but the memories this drink inspires are worth the price instead of paying for a plane ticket to Hong Kong. 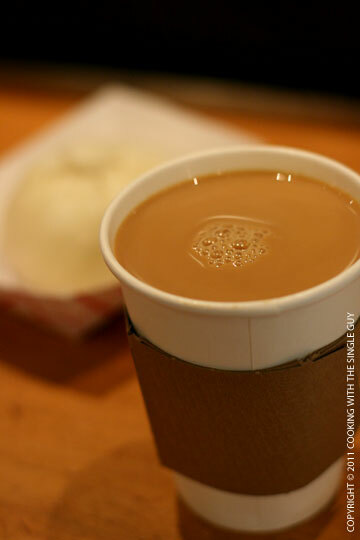 So I think I have a new Saturday morning routine: get a steamed bun at Out the Door and sip on a cup of HK milk tea. All I need is a Chinese newspaper and a chirping bird in a bamboo bird cage and I can retire as the Chinese old man. This weekend is inter-league play in baseball, which brings the Bay Bridge series to town with the San Francisco Giants hosting its bay rivals the Oakland A's at AT&T Park. 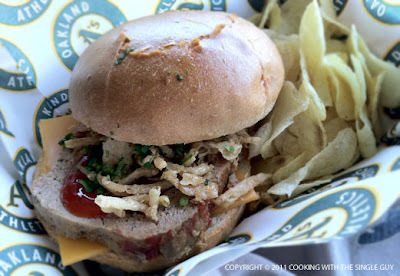 I thought it'll be a good time to post about the new food items I found so far at the two home ballparks. 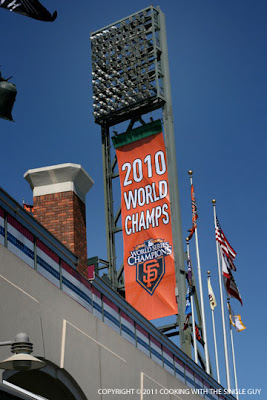 I start at AT&T Park, home of the 2010 World Series Champions!! 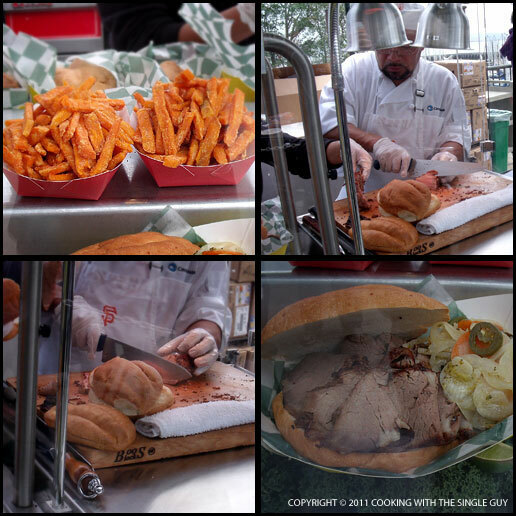 One of the new items talked about is this tri-tip sandwich next to the Orlando hut. The sandwiches are freshly carved and served up with the additional sides of sweet potato fries. But because I'm not a big red meat eater, I actually didn't try this. 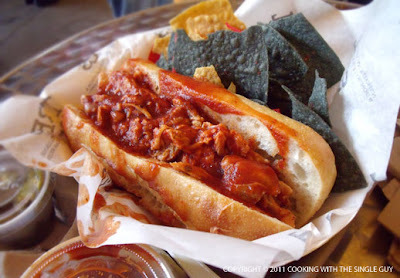 I found this at the Tres Mexican Kitchen, which sells a Mexican-style bacon wrapped hot dog. 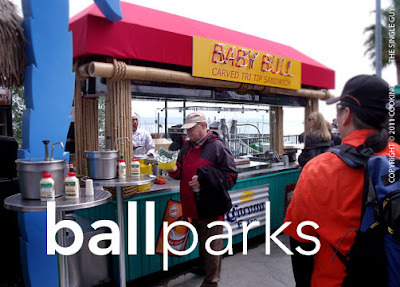 (Their hut is on the field level promenade near third base.) This is what's known as the torta ahogada ($8), which is shredded chicken in a bun lathered in sauce. It was served up with chips and a couple of different hot sauces. I placed some slices of jalapeno's on top too, and it was like eating chicken nachos, but more messy. 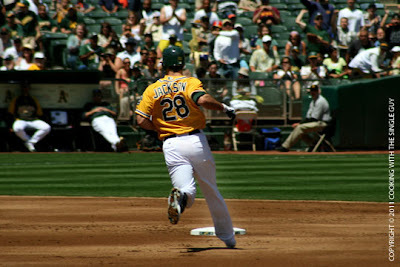 Over at the Oakland Coliseum, now with the unfortunate name of Overstock.com Coliseum, there weren't that many new items. 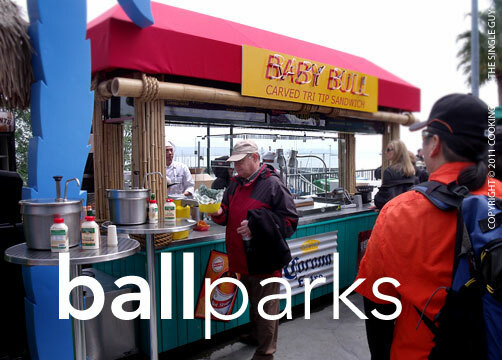 But one of the stands that sell the straight-forward hot dogs and ballpark fare also had two new sandwiches that looked interesting. The first one is called the Mamacita ($9), and it's shredded pork with jack cheese and pico de gallo, pickled jalapenos, and shredded lettuce in a ciabatta roll. It wasn't bad, but I wasn't a fan of the ciabatta roll; seemed stale. The sandwich is served with potato chips. The other sandwich (also $9) was the Grand Slam, and that's a bacon and jalapeno meatloaf sandwich with cheddar cheese, fried onions, and sweet and sour sauce on a brioche bun. Now, on paper it sounded really gourmet, but what was served up looked really sad. The meatloaf itself just had bits of bacon and jalapeno but was on the cold side and the meat tasted of a really poor quality. The sauce wasn't that exciting and the brioche bun was weird. The only interesting thing on the sandwich was the thinly fried onion bits that added a nice crunch to what otherwise a poorly named sandwich because this was no grand slam, not even a home run. 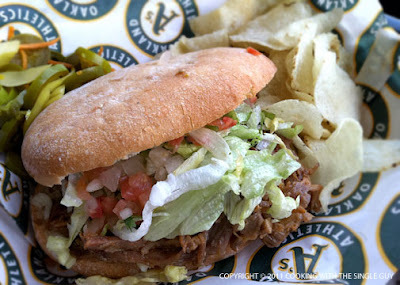 Still, I realize ballparks aren't necessarily the place to find gourmet food, especially healthy gourmet food. 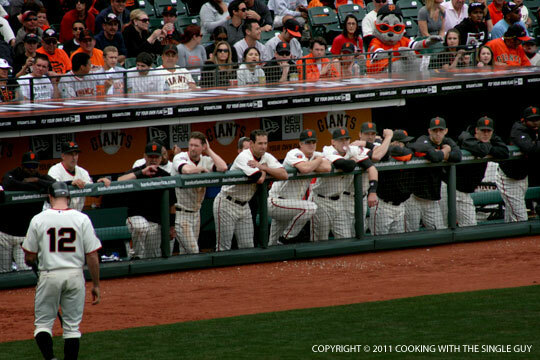 It doesn't seem like there's a lot new at both ballparks (although I heard there's a new BBQ stand under the bleachers at the Giants' ballpark, so I have to hunt that down) so really it's just enjoying the scene and the players. As I'm writing this post, the Giants are about to sweep the A's in the Bay Bridge series, so I have to give the edge to the Giants as the most enjoyable ballpark experience in the Bay. 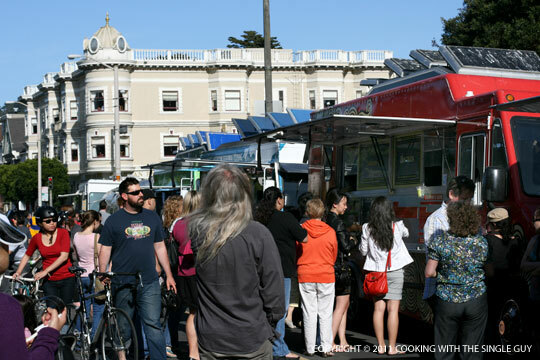 The food truck sensation has reached such heights in San Francisco that the popular weekly Off the Grid food truck gathering at Fort Mason has spawned nearly seven sibling OTGs around town. 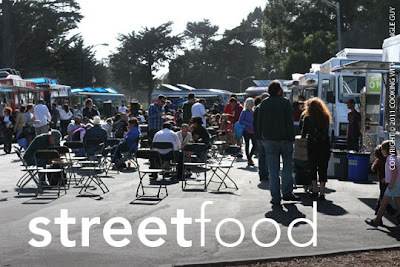 The Fort Mason event on Friday nights still remains the largest gathering, but I decided recently to check out one of the other OTGs, specifically the OTG in Upper Haight. This OTG occurs on Thursday from 4:30 to 8:30 p.m. near Stanyan and Waller. Just a stone’s throw from the Golden Gate Park, the spot has a feel like you’re dining in a meadow, giving it a picnic feel (once our weather warms up). When I arrived right after work, the OTG wasn’t that crowded so there weren’t that many lines at the trucks. For example, this was an interesting sight: a short line at Chairman Bao! This truck consistently has a line whenever it makes an appearance. I took advantage of the short line and ordered its special bun for the night, a Muscove duck bun with spicy aioli and green papaya salad ($4.50). Chairman Bao’s buns are always a challenge to eat, but they’re always worth it because of the creativity and flavors. 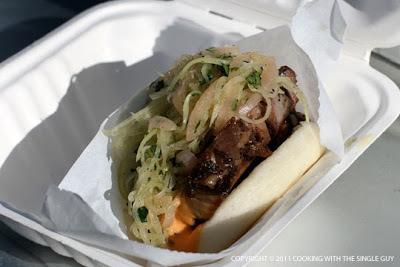 This special duck bun wasn’t any different. My first bite basically was filled with most of the crunchy green papaya salad on top. 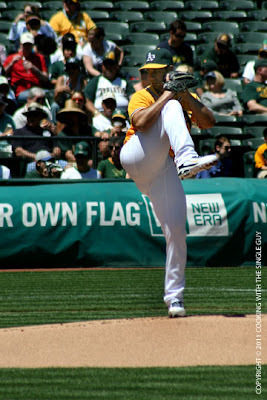 Eventually I got to the tender duck meat underneath that had a nice mild kick from the spicy aioli. 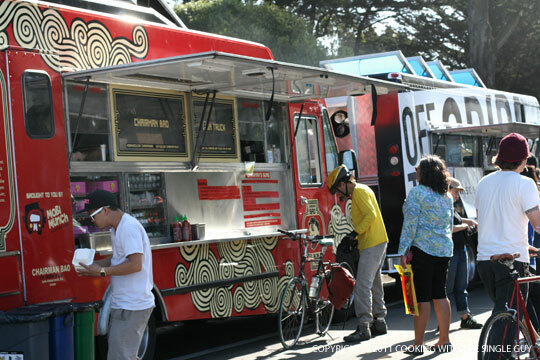 OTG: Upper Haight has a mix of old favorites like Chairman Bao, Curry Up Now, and Seoul on Wheels, with a few trucks I’d never heard of. Like this rock star truck calling themselves Brass Knuckles. 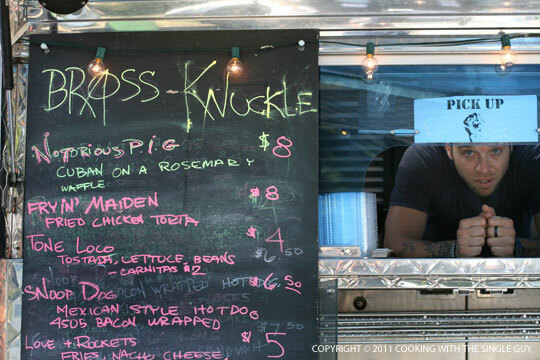 It appeals to the fried foods-loving crowd, with its fries and bacon-wrapped hot dog, but I was intrigued by its “Notorious P.I.G” ($8), a Cubana-like sandwich made with a rosemary waffle. I didn’t know what to expect since I’m generally not a waffle eater, but this just blew me away. The waffle was perfectly cooked, light with crispy edges and just the faintest of rosemary flavor. 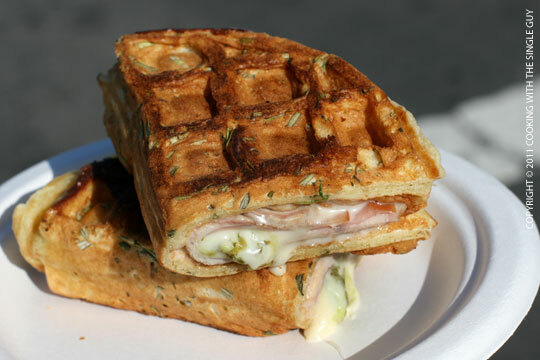 Inside was the typical ingredients of a Cuban sandwich, which means strips of cold cuts like ham all held together in the pressed waffle sandwich by the cheese. One of the best street food I’ve eaten in years. By now I was ready for dessert, and you can always count on a cupcake truck, and at Upper Haight it’s the reliable CupKates, who drives over from the East Bay. 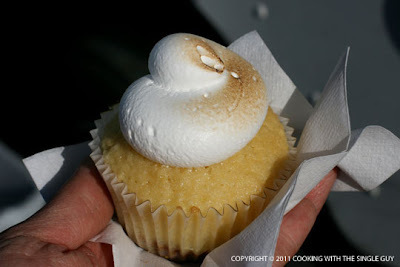 I ended up getting the seasonal lemon meringue cupcake, which was a bit difficult to eat because of the meringue topping, but such a lemony and moist cake. Unfortunately, because this is a seasonal flavor, the week I was there was the last week CupKates was selling this flavor. 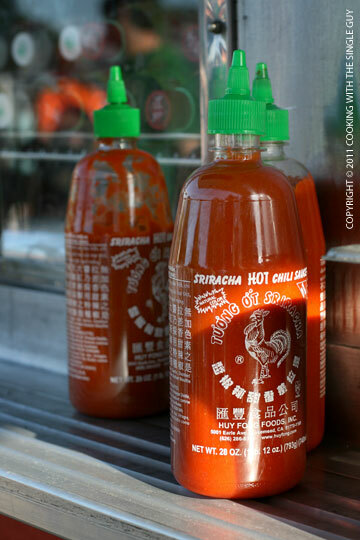 But I’m sure you’ll find another favorite flavor among its many choices. OTG: Upper Haight actually has a cozier feel because it’s smaller than the event at Fort Mason (although the neighborhood does have the same cold gusty wind like the Marina). If you haven’t checked it out, head out there tonight. Soon I bet there’ll be an OTG every night of the week. But I’m not complaining. 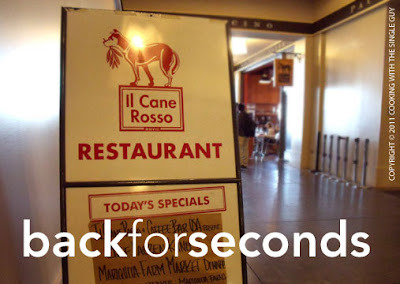 On a busy Saturday at the Ferry Building, you can always count on getting a good breakfast or lunch sandwich at Il Cane Rosso, the casual Italian rotisserie from Chefs Daniel Patterson and Lauren Kiino. But the tiny spot across from the Slanted Door also serves up a nightly three-course dinner for the reasonable price of $25. I've been meaning to check out dinner at Il Cane Rosso (which is now reportedly fully under Kiino's helm after Patterson parted ways to focus on his many other new ventures on the East Bay), and finally made it last week with my friend Hector. Dinner isn't that much different than lunch, except you don't have to go up to the counter to order. But you still sit at the simple silver-painted metal tables and chairs in the lobby (right outside the restrooms) or outside in the patio with a view of the bay. Since it was our first time for dinner, we weren't sure whether to just sit down or wait to be seated. There wasn't really a sign, and none of the waiters who kept going back and forth really paid much attention to us. We actually waited for awhile as the sous chefs behind the counter avoided eye contact with us. Hector and I both ordered the set dinner, which started with a plate of roasted Delta asparagus with agretti, capers and dill aioli. This was fresh with a bright flavor. While I'm generally not a fan of dill, it was milder in flavor as an aioli and actually served as a nice binder for all the ingredients in the salad. Before we got to the second course, we did order a side of roasted potatoes for an additional $5. 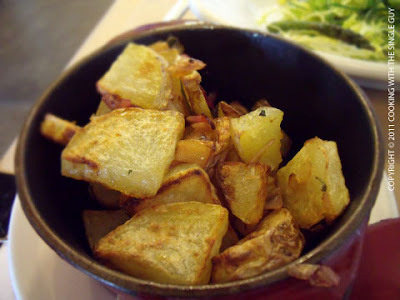 While these potatoes looked beautiful, it was oddly soft and not much of a crispy edge. Our main course was a Marin Sun Farms pork and chorizo stew with braised fennel stalks, kale and garlic-rubbed crostini. 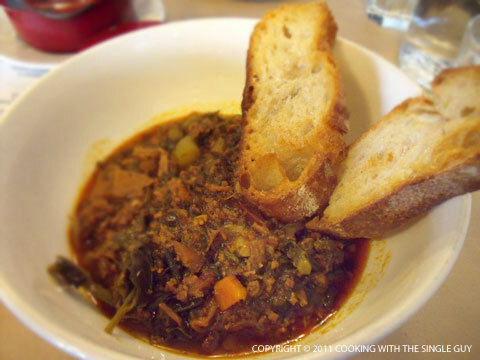 The stew had a lot of flavor and every bite was filled with chunks of tenderly cooked pork. It was a hearty dish that warmed up the cold night. 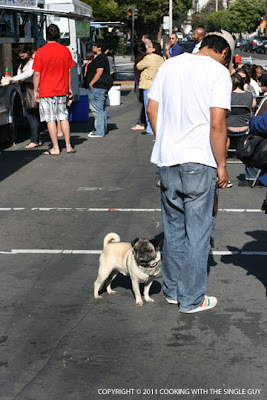 The only downside was the extremely tough crostini (Hector nearly choked to death on a piece). 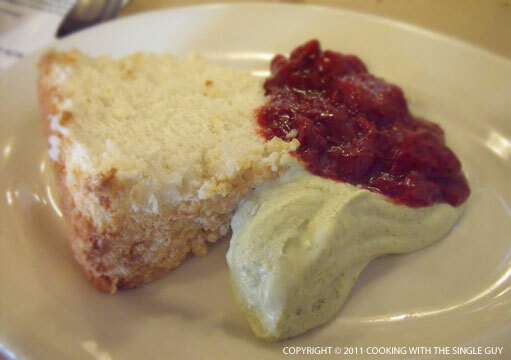 The third and final course was dessert, an Angel food cake with strawberries and lemon balm cream. The cake was light and fluffy, with the perfect spongy spring of an Angel food cake. But Hector and I agreed the highlight was the lemon balm cream. The word balm threw us off, making us think we were eating some kind of lip balm, but a server told us that "lemon balm" is actually an herb, and the lovely lemony flavor was infused into a cream that had a pale green color that was very enjoyable. Not so enjoyable was the strawberries, which was served like a jam or compote. For some reason it wasn't very sweet despite the fact that it's strawberry season. Our dinner at Il Cane Rosso seemed to have a different vibe than lunch. It was less crowded and less bustling, very quiet and a bit mellow. And without the sun over the water, you basically just feel like you're eating at a pop up restaurant or on the sidewalk. Unfortunately on our night, the service wasn't that attentive as well, which didn't enhance our dining experience. 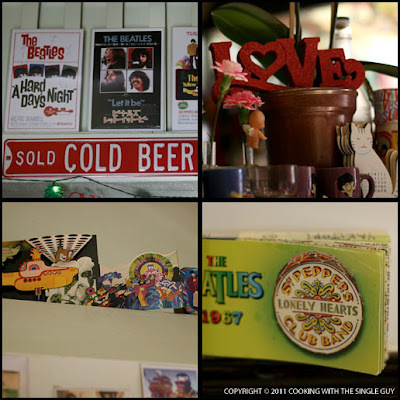 In a place so casual and rustic, you expect more friendly charm to make up for the lack of decor or fancy surroundings. While the food is fun and seasonal, it seems to lack the punch or freshness of lunch. While it's a good option if you need a quick dinner in the neighborhood, I'm not sure if it's worth making a special trip.